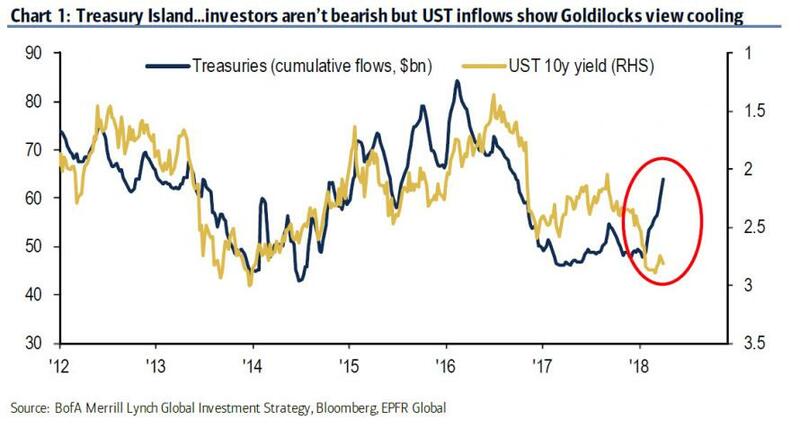 BofA: "The Key Story For The Bond Market Is About To Play Out"
In its weekly commentary on the Treasury yield curve, Deutsche Bank focuses on the sharp flattening that has taken place in the past 6 months, noting that "fiscal shocks, which started with bear steepening, are gradually migrating to the front end and the curve continues to bear flatten." ... the stability of the long end remains unshaken. Why is the long-end seemingly impervious to both volatility and selling? According to DB's derivative strategist Alex Kocic, "at the moment, bonds are enjoying considerable positive externality due to residual QE demand, favorable rate differential, stable USD, pension fund rebalancing flows and a general environment of unwind of the QE. 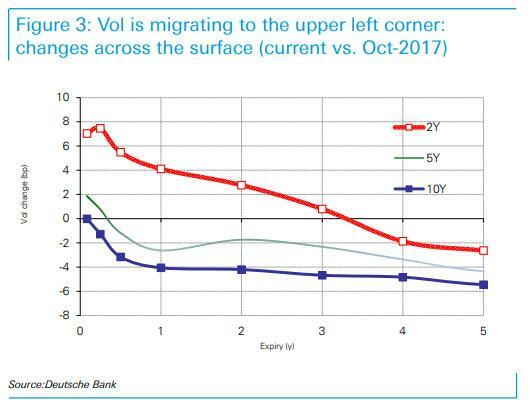 All of this is supportive for the long end of the US curve and bearish for bond vol, which only reinforces its appeal." 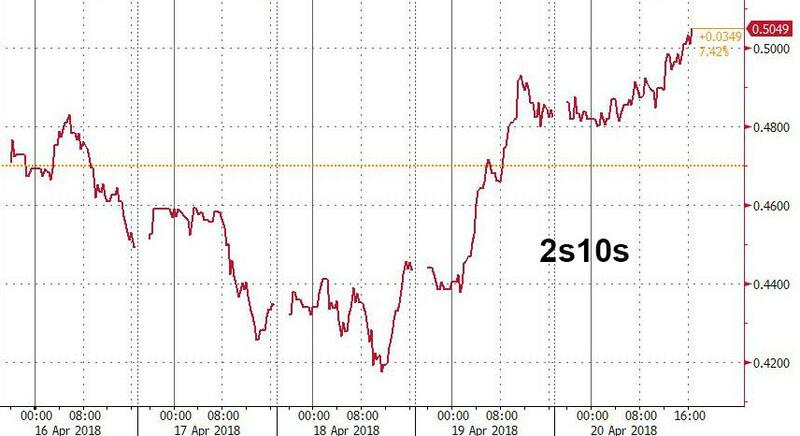 Perhaps, but there certainly are occasional episodes like the one from last week, when the curve blew out sharply, and from a decade low of 42bps, the 2s10s spread surged to just above 50bps in the span of 48 hours, amid a sharp selloff in the 10Y, which saw its yield balloon to 2.96% from 2.82% just 2 days earlier. ... to a return of general wage inflation fears, to strong earnings, and even Chinese selling, suggested as catalysts. 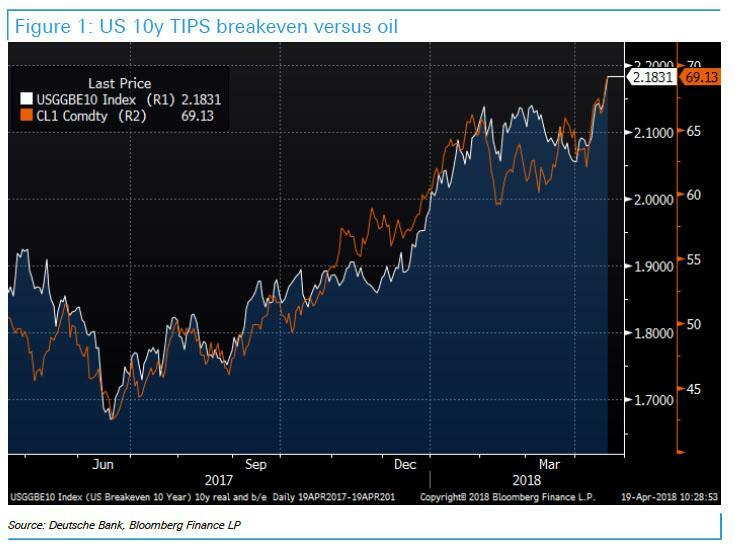 Whatever the reason for last week's sharp selloff - and curve steepening - an even more important question that has emerged is whether the selling will continue, and will the 10Y finally break above 3% resulting in yet another VaR shock as one of the two most important - and opposing - bond market trendlines in the world is finally broken. 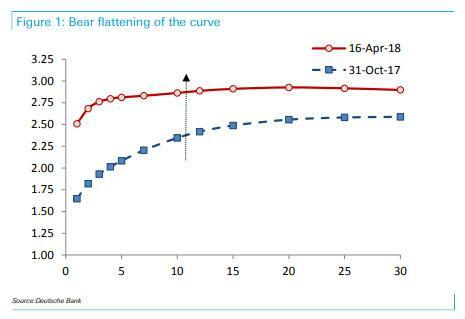 And while there is a near record number of bond shorts who are confident that it's only a matter of time before the 10Y puts 3% in the rearview mirror, something which the market has very clearly priced in and which according to Citi is a "massive problem for the bond market", Bank of America presents contrarian view. According to BofA's chief credit strategist Hans Mikkelsen, "the key story to play out very soon in the back-end of the curve is the pension reallocation out of equities and into long duration bonds prompted by tax reform." "basically companies with underfunded pension plans have until 8.5 months after the end of their fiscal year to make pension contributions and deduct at last year's tax rate (35% in many cases) as opposed to only the new 21% rate." Needless to say, all companies who can, will take advantage of the higher rate deductible, which in turn means that there is a pent up bid - "bid on the sidelines" if you will - from the univers of pension investors just waiting to be unleashed. Once deducted, the pension contribution proceeds - as well as the de-risking proceeds out of equities within existing pension assets - then get invested in long duration corporate bonds primarily as well as some Treasuries. Here BofA documented some details from companies announcing discretionary pension contributions during the 4Q earnings reporting season (table below). What BofA found is that by now companies are further in their planning phase following tax reform, "and during the 1Q reporting season we expect many more companies will announce discretionary pension contributions." And while there was little pension buying during the first part of the year, with the typical lag between announcement and buying in the back-end, BofA is confident that we should soon see a big increase in the demand for long-end paper, both corporate and govvie, something that recent Tsy fund flows have already hinted at. 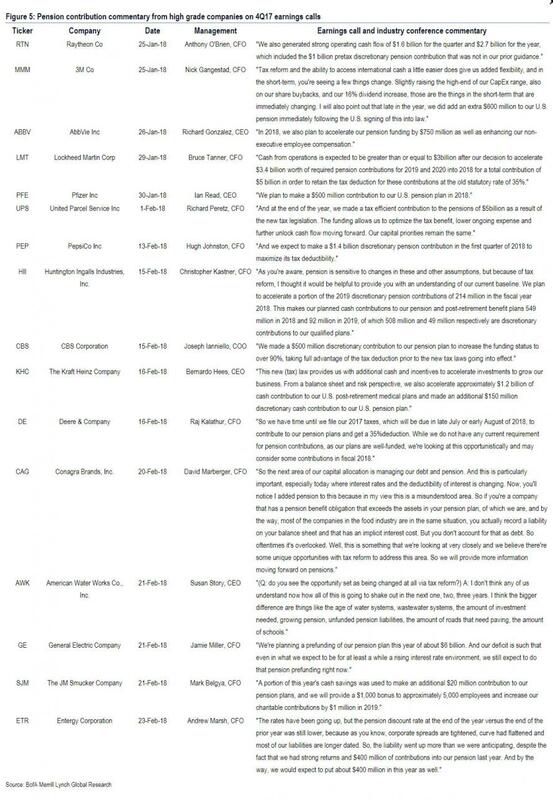 Finally, here is BofA's scraping of Q42 2017 high grade earnings calls for commentary and discussions on pension contribution.